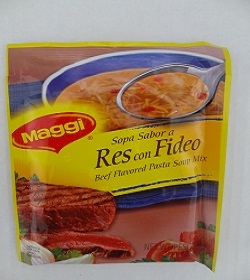 Beef Flavored Pasta Soup Mix by Maggi - Sopa Sabor a Res con Fideo. 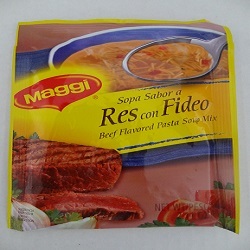 Beef Flavored Pasta Soup Mix by Maggi - Maggi Sopa Sabor a Res con Fideo. Simply delicious and cholesterol free. Prepares in minutes, 4 servings. 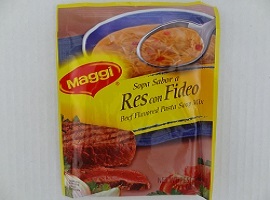 Could be use as a base to prepare other dishes. 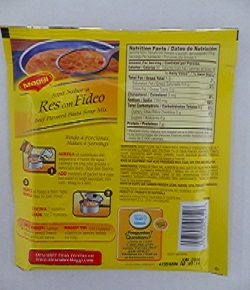 Deliciosa sopa tipo casera de res, fideos y vegetales. Facil de prepara, rinde 4 porciones. No contiene colesterol.